There are many Android users who are visually impaired and blind. So they need some unique and different apps according to their needs. 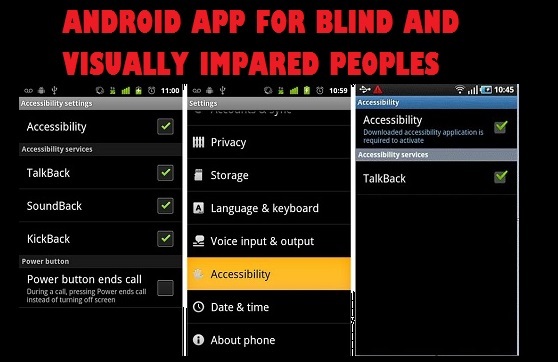 Here is a list of Apps which will help the impaired and blind people to work with their Android. Let's see them. There are many Android users who are visually impaired and blind. So they need some unique and different apps according to their needs. Here is a list of Apps which will help the impaired and blind people to work with their Android. If you know any one you know and feel that any one of the below mentioned app may help them, then please tell them about it. Let's see these apps. Part of Google’s Android Accessibility Service, this app is developed to assist visually impaired people to use their cell phones in a easy manner. The application reads out the texts loud, all the movements of the user are carefully evaluated and then is spoken by the app. To enable this app, go to Settings then to Accessibility, and enable TalkBack service. Get Talk Back App now. As the name suggests this app helps visually impaired people to read the small and tiny printed letters. The suggested minimum distance to keep is four inches from the reading scripts. The app supports features like long press to turn lights on and off, double tap to zoom in and out, and single tap to maintain focus. This application is similar to the previous one. This application works in a best way with the phones that do not have the locked down Camera API’s. Users can also change scenes of objects and also select form sepia, negative color, solarized effects, mono Ciba Vision Air Optix Aqua and aqua. 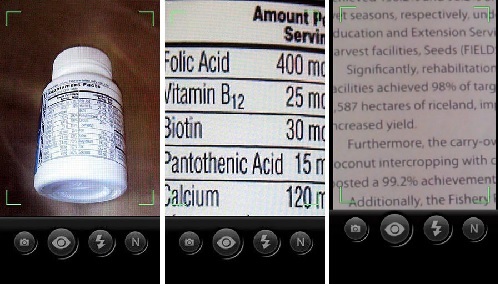 Get Ultra Magnifier+ App now. This application is designed in such a way that any visually impaired or blind people can walk easily with this app on hand. This app has a navigation system that helps people to walk through the streets using the mobile phone. Compass directions, current locations and pointing directions is done simultaneously with instant notification update. If the person goes off the track the vibration mode will instantly trigger to provide the direction and warn him/her. Get Walky Talky App now. Classic Text To Speech Engine is actually a text to voice converter which is developed by SVOX mobile Voices. Visually impaired people can do lots of thing through it. More than 40 male as well as female voices are used in this app to read out the users texts, e-books, translations, and even navigation's. It can also reads PDFs Documents as well. Get Classic Text To Speech Engine App now. Thank you for reading this post. Share this post with the needy people. Ask any question in comment.